Let’s start at the very beginning. When a mammalian egg is successfully fertilized by a single sperm, the result is a single cell called a zygote. A zygote has the potential to grow into a full-bodied organism. It is mind-boggling that this single cell, containing the genetic material from both parents, can divide itself to make two cells, then four cells, then eight cells, and so on, until it becomes a tiny ball of 300-400 stem cells. Early Development and Stem Cell Diagram, modified by author to include ESC and TSC labels. 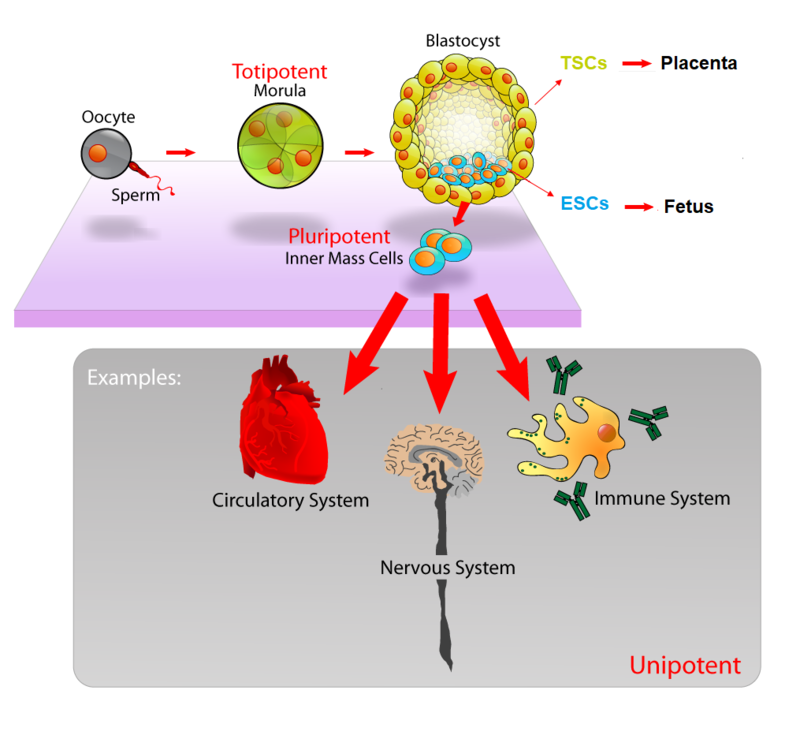 At these early stages, these stem cells are totipotent, meaning that they have the potential to become either embryonic stem cells (ESCs), which will eventually become the fetus itself, or extraembryonic trophoblast cells (TSCs), which go on to help form the placenta. That ball of ESCs and TSCs develops into a blastocyst with a tight ball of ESCs on the inside, and a layer of TSCs on the outside (See Figure 1). You might imagine the blastocyst as a pomegranate, with the seeds representing the ESCs and the outer skin representing the TSCs. The ESCs have the potential to transform, or differentiate, into any type of cell in the entire body, including heart cells, brain cells, skin cells, etc., which will ultimately become a complete organism. The outer layer TSCs have the ability to differentiate into another type of cell that will ultimately attach itself to the wall of the uterus of the mother to become the placenta, which will provide the embryo with proper nutrients for growth. Scientists in the field of developmental biology are absolutely bonkers over this early stage of embryogenesis, or the process of embryo formation and development. How do the cells know to become ESCs or TSCs? What tells the ESCs to then differentiate into heart cells, or brain cells, or skin cells? What signals provide a blueprint for the embryos to continue growing into fully-fledged organisms? The questions are endless. The challenge with studying embryogenesis is that it is incredibly difficult to find ways to visualize and research the development of mammalian embryos, as they generally do all of their growing, dividing, and differentiating inside the uterus of the mother. In recent years, there have been multiple attempts to grow artificial embryos in a dish from a single cell in order to study the early stages of development. However, previous attempts at growing artificial embryos from stem cells face the challenge that embryonic cells are exquisitely sensitive and require the right environment to properly coordinate with each other to form a functional embryo. Enter stage right, several teams of researchers at the University of Cambridge are successfully conducting groundbreaking research on how to grow artificial mouse embryos, often called embryoids, in a dish. In a paper published in Development last month, David Turner and colleagues in the Martinez-Arias laboratory report a unique step-by-step protocol developed in their lab that uses 300 mouse ESCs to form tiny balls that mimic early development. Mouse embryonic stem cell aggregates with polarized gene expression in a dish (4 days in culture). Image courtesy of authors. doi.org/10.11.01/051722. These tiny balls of mouse ESCs are collectively termed “Gastruloids” and are able to self-organize and establish a coordinate system that allows the cells to go from a ball-shape to an early-embryo shape with a head-to-tail axis. The formation of an axis is a crucial step in the earliest stages of embryo development, and it is exciting that this new model system may allow scientists to better study the genes that are turned on and off in these early stages. In a paper published in Science this past April, Sarah Harrison and her team in the Zernicka-Goetz laboratory (also at Cambridge) report another technique in which mouse ESCs and TSCs are grown together in a 3D scaffold instead of simply in a liquid media. The 3D scaffold appears to give the cells a support system that mimics that environment in the uterus and allows the cells to assemble properly and form a blastocyst-like structure. 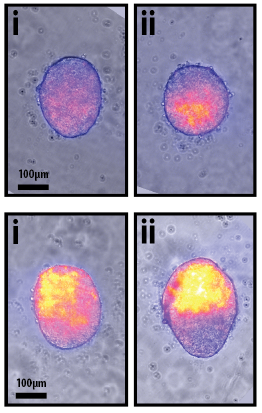 Using this artificial mouse embryo, the researchers are attempting to simulate the growth of a blastocyst and use genetic markers to confirm that the artificial embryo is expressing the same genes as a real embryo at any given stage. The researchers found that when the two types of stem cells, ESCs and TSCs, were put together in the scaffold, the cells appear to communicate with each other and go through choreographed movement and growth that mimics the developmental stages of a normal developing embryo. This is enormously exciting, as models like this artificial embryo and the Gastruloid have the potential to be used as simplified models to study the earliest stages of embryo development, including how ESCs self-organize, how the ESCs and TSCs communicate with each other to pattern embryonic tissues, and when different genetic markers of development are expressed. It is important to note that this artificial embryo is missing a third tissue type, called the endoderm, that would eventually form the yolk sac, which is important for providing blood supply to the fetus. Therefore, the artificial embryo does not have the potential to develop into a fetus if it is allowed to continue growing in the dish. The fact that these artificial embryos cannot develop into fully-fledged organisms relieves some of the controversial ethical issues of growing organisms in a dish, and will allow researchers to study critical stages of development in an artificial system. These techniques and discoveries developed by these teams of researchers have the potential to be applied to studies of early human development. These models may prove especially useful in studying how the maternal environment around the embryo may contribute to fetal health, birth defects, or loss of pregnancy. In the future, artificial embryos, coupled with the not-so-futuristic gene editing techniques that are currently in development to fix disease genes, may prove key in the quest to ensure healthy offspring. Peer Edited by Nicole Smiddy and Megan Justice. Our bodies are marvels of precise control, synchronization and design. Every one of our cells has the same genetic sequence, but we have many different types of cells – heart, muscle, lung, skin. Amazingly, our body has a mechanism to determine which cell is which even though they all share the same code. The field of epigenetics dives into this phenomenon. Epigenetics is a study of changes to DNA that does not change the actual sequence but modify it by repressing or activating certain parts of DNA. In short, epigenetics can reversibly turn genes on and off without changing the DNA sequence. The genes in our body are like words that have to be spelled a certain way in order for them to work properly. 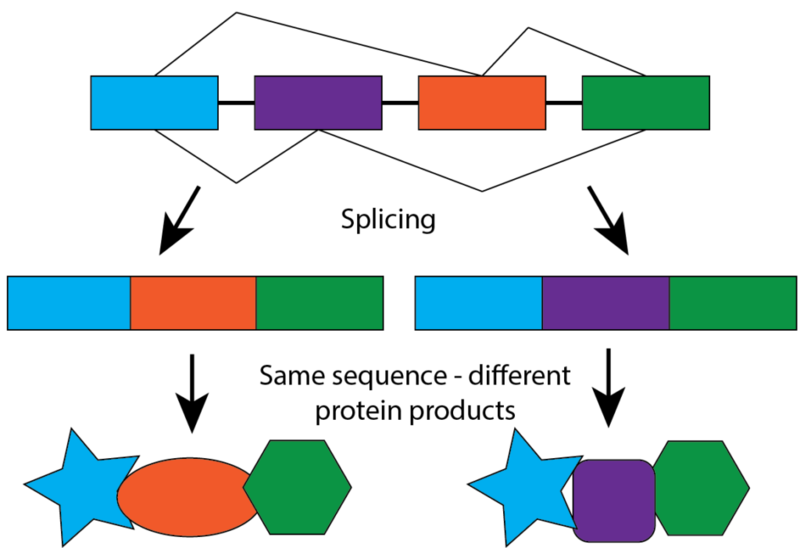 All genes are made up of “base” molecules, which are assigned a specific letter (A, C, G, or T). These bases combine to form 3-letter “words,” or amino acids. Amino acids serve as the “words” that form the “sentences” or proteins in our body that govern all the biological processes necessary for life. However, none of these biological phenomena could be produced if there are misspellings in the genetic code. Mutations are a misspelling of the original genetic code through deleting, duplicating, substituting or inverting parts of a gene. Mutations are permanent changes to the DNA code which can be passed on from generation to generation. This is the cause of many heritable diseases. For a long time, genetic changes were thought to be permanent, but reversible epigenetic changes were uncovered around 1950 and have led to an explosion of knowledge in understanding the human body. Conrad Waddington was the first scientist to propose the concept of epigenetics. He studied embryonic development and saw how an embryo gave rise to all the different types of cells, even though every cell had the same genetic sequence. 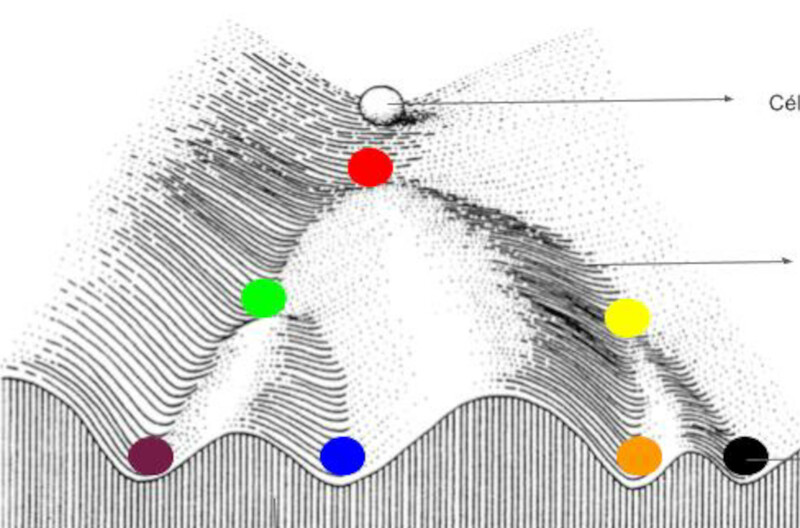 He visualized this model with “Waddington’s landscape,” which used the analogy of a marble rolling down a hill into different troughs to represent the developing cell becoming a muscle cell, heart cell or any other cell. The marble example that Waddington used to describe an embryonic stem cell becoming other cells. Alternative splicing is one epigenetic mechanism that allows for cells to be able to choose multiple fates. This can happen all over the body, such as in the brain, heart, and muscle. Our body has many genes, but we only use 2% of those genes to code for proteins, the other 98% are genes that help regulate the protein-coding genes. Alternative splicing is one way that we fully utilize the 2% of our genes that code for protein and accounts for our complexity. Splicing allows for the “word” of one gene to be broken up into many different ways to make many other genes. The word “lifetime” can be broken up into ‘life’ and ‘time,’ but can also be rearranged to make the words ‘fit,’ ‘lie,’ and ‘tile.’ The parts of protein-coding genes can be also be broken down and mixed and matched to produce different proteins. The sites for splicing are determined by the tightness of DNA, the accessibility to DNA, and other epigenetic factors that are still being actively researched. An example of how alternative splicing can produce different protein products. Dr. Jimena Guidice at the University of North Carolina at Chapel Hill is actively investigating the epigenetics of alternative splicing in the heart to try to determine why certain heart diseases cause the heart to revert back to fetal alternative splicing as opposed to adult alternative splicing. A few weeks postnatal, the muscle cells needed to contract the heart are not yet mature and have a different alternative splicing pattern to facilitate growth into adult muscle cells. Eventually, the muscle cells are spliced with a different alternative splicing pattern which is a mark of adult muscle cells since these cells are large and can pump blood to the heart more efficiently. If you’re interested in reading more about epigenetics and its history, I highly recommend Nessa Carey’s Epigenetics Revolution and Siddhartha Mukherjee’s The Gene. Peer edited by Deirdre Sackett. Reverse Aging and Live Longer: No Creams, Just Genes. Gray hair, wrinkles, balding, crow’s feet – some wear these hallmarks of aging as a proud badge of wisdom and a long adventurous life, while others spend the latter parts of their lives fighting the signs of aging. 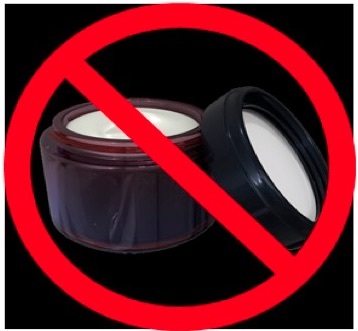 There are a plethora of creams, lotions, diets, and therapeutics promising to make you look younger. However, a recent study suggests that the key to reversing the signs of aging and to living longer lies not in creams or lotions, but in the expression of your genes. A recent study by Dr. Alejandro Ocampo and colleagues reversed multiple hallmarks of aging or the time-related decline in bodily functions required for survival and reproduction, in mice by expressing excess levels of four genes in various tissues and organs. The products made by the four genes are collectively called Yamanaka factors, after Nobel Laureate Dr. Shinya Yamanaka. Before the work of Dr. Yamanaka, it was thought cell programming is a unidirectional process; that is, an unprogrammed stem cell can be programmed into a skin or muscle cell, but once cellular programming has taken place, the cell cannot be reverted back to a stem cell. Dr. Yamanaka disproved this theory when he showed that excess expression of all four Yamanaka factors, which are naturally found at some level in all human cells, could revert or reprogram mouse fibroblast cells back into unprogrammed stem cells. Other techniques could then be used to reprogram these stem cells into any one of multiple cell types. The ability to reprogram fibroblasts into stem cells opened many new avenues of research in the stem cell field. Perhaps, one of the most intriguing is the study of stem cells in the regeneration of human tissue. Following an injury, stem cells can program themselves to fill in for the injured cells, thus allowing the body to continually regenerate tissues and maintain optimum function. Because of their vital role in regeneration and tissue maintenance, we are born with large pools of unprogrammed stem cells in our bodies. However, as we age, this pool of unprogrammed stem cells decreases, and we are less able to regenerate injured tissues or organs. This leads to the classic signs of aging such as increased recovery times, susceptibility to illness, and metabolic issues. The premise of the studies by Ocampo and colleagues is that replenishing the pool of unprogrammed cells would increase regeneration in mice and reverse the aging process, while extending the organism’s lifespan. To replenish the pool of stem cells, scientists developed prematurely aging mice that produce the four Yamanaka factors in multiple tissues and organs of the mouse body. Production of the factors was placed under control of the antibiotic doxycycline, so that the cells would only produce excess Yamanaka factors when the mice were fed doxycycline. This allowed the scientists to control production of the factors and turn them on and off, similarly to how a lightswitch controls the lights in your living room. After doxycycline treatment, collagen producing cells in connective tissues of the mice were found to have increased metabolic function. In other words, these cells were more efficient at using nutrients to make energy and other biological molecules necessary for proper cell function. Furthermore, these cells were better able to maintain their DNA, as they showed less DNA damage than cells not expressing the Yamanaka factors. Because DNA damage is a hallmark of aging, these results suggest the aging process was reversed in the isolated collagen cells. In addition to short-term effects on DNA damage and metabolic functions, Ocampo and colleagues explored the long term effects of Yamanaka factors on aging. Because previous studies showed excess expression of Yamanaka factors in mice leads to cancer, the first step to examining long-term effects was to develop a protocol to avoid cancer development in the mice. After much optimization of their inducible system, Ocampo and colleagues showed lower, intermittent doses of doxycycline resulted in excess expression of Yamanaka factors without cancer development. Even with decreased production of the factors, mice still exhibited fewer signs of aging than mice without inducible expression of the factors. 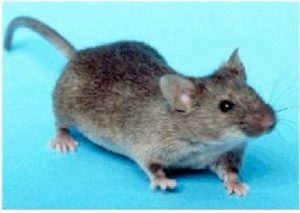 The most striking evidence of age reversal in the mice was an increase in lifespan. 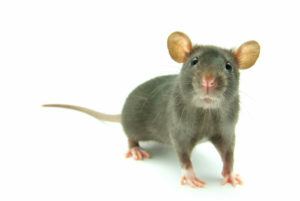 Mice producing the Yamanaka factors lived 33% longer than mice not producing Yamanaka factors. In addition to increased lifespan, mice expressing Yamanaka factors had healthier, thicker skin, a healthier spleen, and less thinning of the gastrointestinal tract, suggesting the mice experienced a reversal in the aging process within these tissues. Although reductions in age-related tissue damage were remarkable, aging was not reversed in all tissues and organs. There was little, if any, improvement in the aging of the heart, liver or skeletal muscle. Despite the fact aging could not be stopped or reversed in every organ, the ability for Yamanaka factors to reverse the hallmark signs of aging greatly increases our understanding of the aging process. Because aging is a large risk factor for many diseases and illnesses, comprehending the aging process could improve treatment of diseases that primarily affect the older portion of the population. Furthermore, knowledge of the aging process could lead to new therapeutic drugs to combat aging for health and cosmetic reasons. It is unlikely that a magic pill to stay young forever will be on the market in the near future. However, the work of Ocampo and colleagues will surely help pave the way in our fight against age related diseases. Peer edited by Kaylee Helfrich and Katie Veleta. Are Stem Cells Just Tiny Normal Cells? You’re at a social gathering and someone asks, “So, what do you do?” It’s meant to be a casual conversation starter, but do you ever find yourself taking a mental breath before answering? As an immunologist studying stem cells, I take that mental breath to prepare for a dialogue that usually follows about stem cell research, a field that has captured my fascination… and seemingly many of yours. Anyone who knows me well can attest to the fact that I like questions; in fact, as a scientist, my livelihood relies on it. I enjoy asking questions, and I admire those who ask questions in return. Someone recently continued our “So, what do you do?” chat by asking, “What even is a stem cell: just a tiny normal cell?” What a great question! 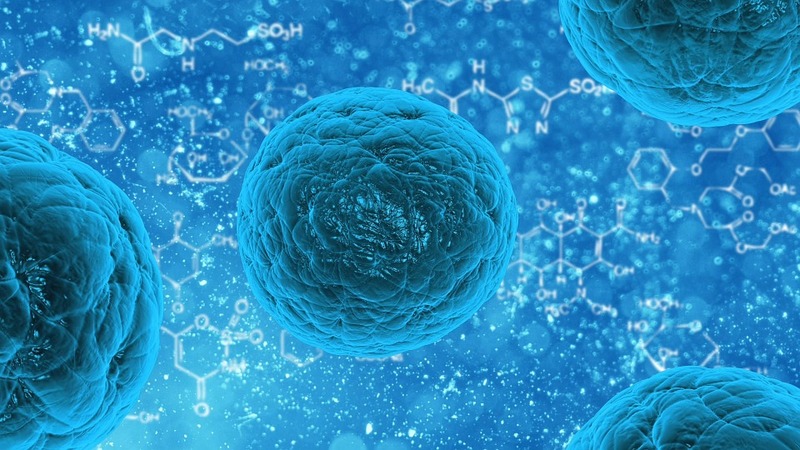 What exactly is a stem cell?